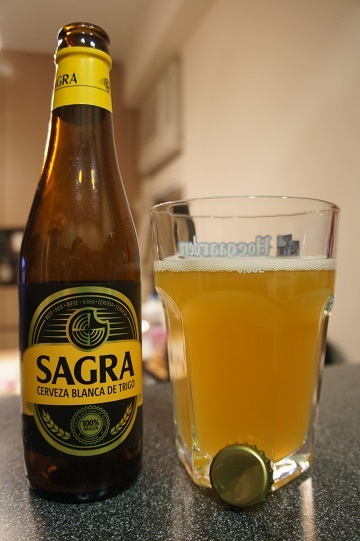 Brewer Description: (from bottle) Very aromatic, blond, full bodied. 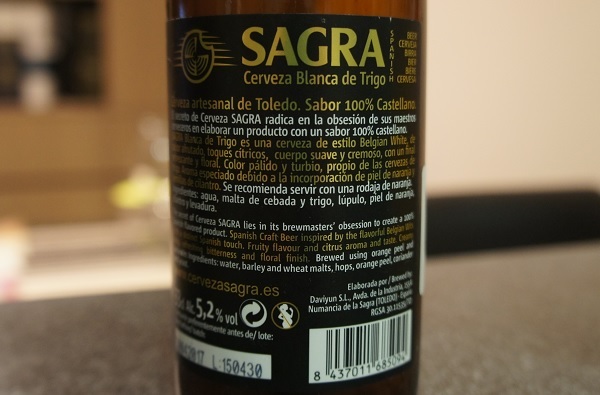 Due to its ale fermentation temperature it has distinct and unforgettable fruit flavors and aromas with a refreshing bitterness and floral finish. Intro: A 330ml bottle with a best before date of 9th April 2017. Poured into a Mikkeller stemmed tasting glass. Appearance: A slightly hazy orange pale copper colour with a one finger white head that had decent retention. Aroma: Fanta orange soda with some bready and caramel malts. 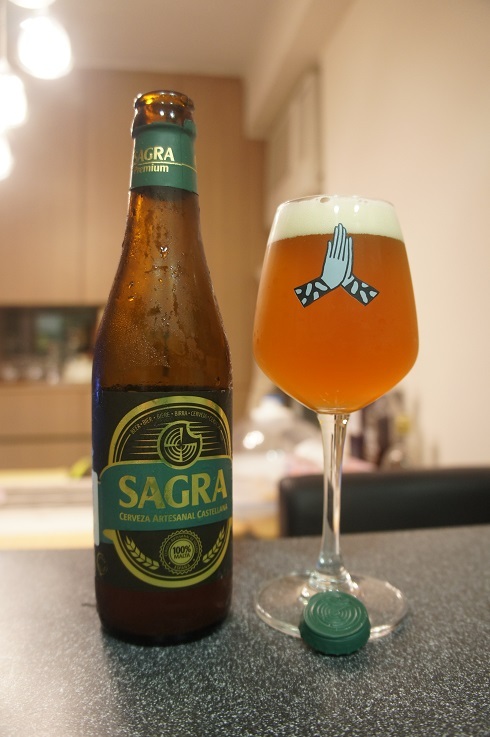 Taste: Orange sweetness mixed with some herbal and floral elements and biscuity malt. Overall: The fruitiness was quite nice, but the herbal elements I was getting, was not really my thing. 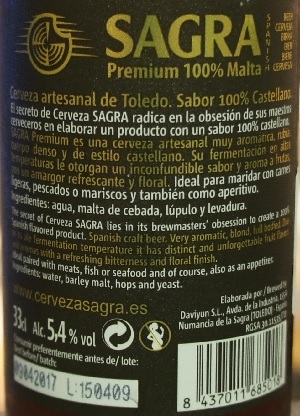 Brewer Description: (from bottle) The secret of Cerveza SAGRA lies in its brewmasters’ obsession to create a 100% Spanish flavoured product. 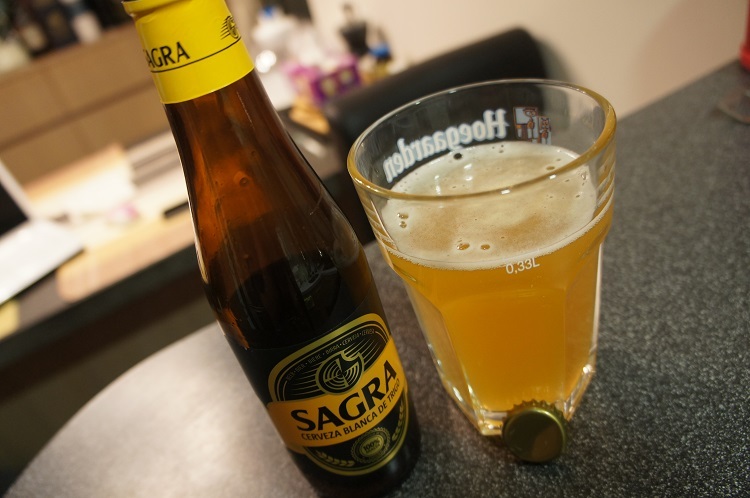 Spanish craft beer inspired by the flavourful Belgian Wits with a distinct Spanish touch. 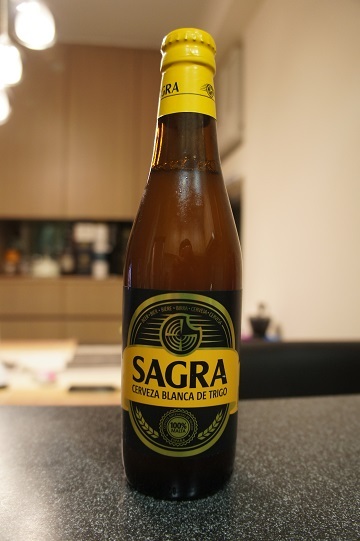 Fruity flavour and citrus aroma and taste. Creamy body, refreshing bitterness and floral finish. 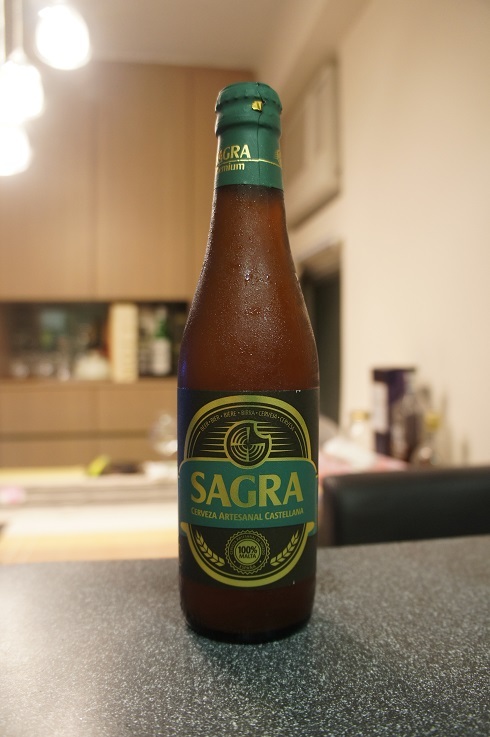 Brewed using orange peel and coriander. Intro: A 330ml bottle with a best before date of 30th April 2017 and poured into a Hoegaarden pint glass. Appearance: The beer poured a hazy golden straw colour with a slightly less than one finger white head that dissipated slowly. Aroma: Strong orange and lemon aromas. Very orange juice like. Taste: Citrus flavours mainly lemon and orange, with a little wheat and a slightly bitter orange peel finish. Mouthfeel: Medium bodied, light to medium carbonation, oily and creamy. Overall: I thought it was ok but the citrus orange and lemon was a bit over the top. Not one of the better witbiers I’ve tried.